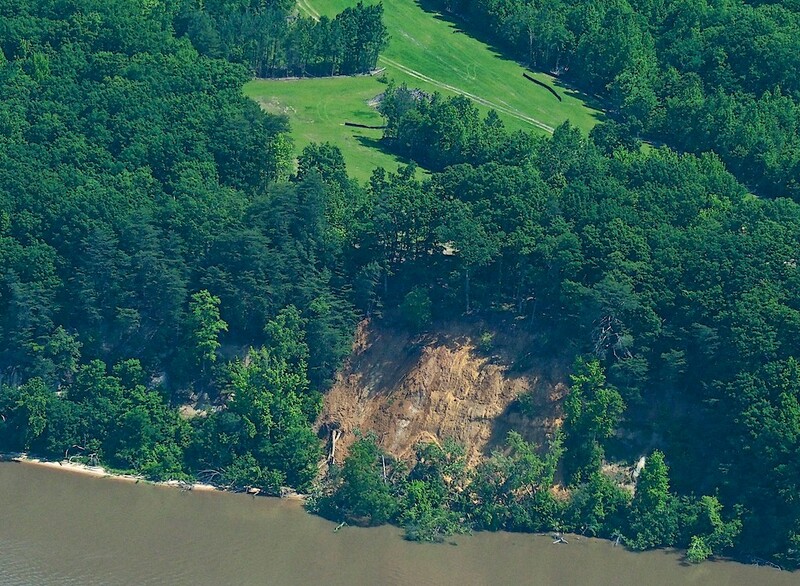 Richmond County officials have seen the recent picture of apparent erosion, from the most recent heavy rain event, along the banks of the Rappahannock River at the proposed site of the Virginia True Development, and are extremely discouraged by the lack of activity surrounding the stop work order and notice to comply, issued over six months ago. “There is a reason the County and State requires Erosion and Sediment Control and Stormwater Permits prior to development commencing, and this is a perfect example of why those proper procedures need to take place” emphasized County Administrator Morgan Quicke. When the Richmond County Board of Supervisors approved the controversial conceptual re-zoning plan in November of 2015, nothing in that approval granted the owners of Virginia True permission to commence land disturbance activities, it only allowed for further consideration of re-zoning the property in a more detailed way, and allowed the owners of the property to proceed with confidence that the property would continue being considered for re-zoning should their details comply with the conceptual zoning the Board approved. In order to obtain the re-zoning in 2015, the developer submitted to the County a list of proffered conditions, outlining their detailed plan to protect the environmentally sensitive landscape and the Rappahannock River. Most would say that their first action on the project was a major miscalculation that will only make the future legal development of this property all the more difficult. “I am deeply disappointed that Virginia True rushed into an unpermitted land disturbance project causing such environmental damage. During the rezoning process Richmond County was repeatedly assured that every precaution would be used to protect the integrity of the cliffs. Unfortunately Virginia True has not lived up to those assurances” said Richmond County Board of Supervisor District 4 Member, Robert Pemberton. “Our number one priority at this point is bringing this land disturbance into complete compliance, and remedying any adverse effects that may be occurring” said Quicke. Erosion and Sediment Control plans have been approved by Richmond County and a permit has been issued. Additionally, the County has secured a $90,000 Letter of Credit on this project to ensure the work performed is implemented in complete accordance with the approved plans. “Should we experience further problems with this project that the owner is not willing to remedy, the County now has the ability to take control of the project to bring about desired results; however, we certainly hope the owner will take responsibility and accountability for the problems caused, and bring this site into full compliance without having to take this alternate route” Quicke said.